Looking for the perfect beverage to ring in the new year? This year, we’ve gathered three of our favorite fun, light, and gorgeous drinks for your midnight toasts! Whether you’re looking for fruity, minty, or jello-filled, we have you covered. What drink will you be ringing in the new year with? Combine the Triple Sec, blackberry brandy, Chambord, and pineapple juice in a large pitcher or punch bowl. Cover and store in the fridge for 4 hours or overnight. Just before serving, add the Triple Sec mixture, ginger ale and the champagne together in a large punch bowl. Serve over ice and garnish with fresh raspberries if desired. 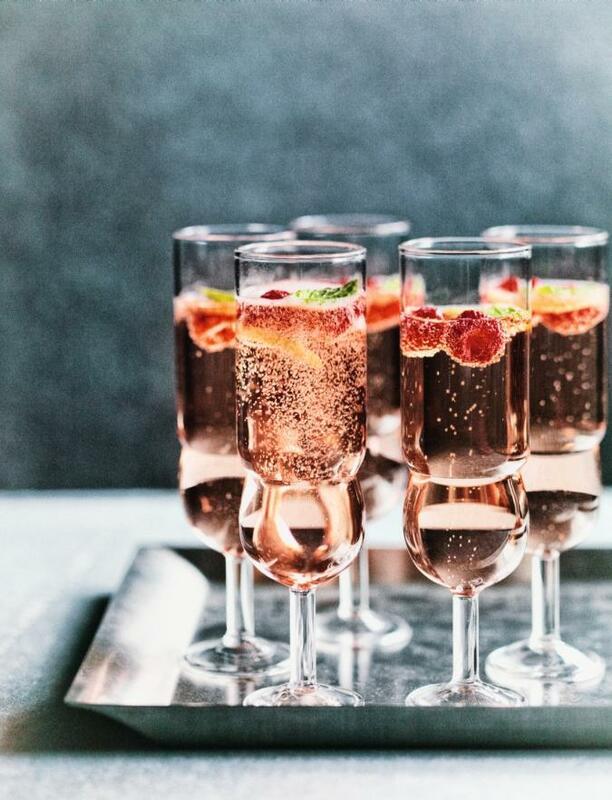 Chill six Champagne glasses, then add the following to each: 2-3 raspberries, 1 mint leaf and 1 tiny sliver of lemon zest. Carefully pop the cork of a 750ml bottle of chilled Fairtrade Moscato Rosé or sparkling Pinot Rosé. Pour slowly into each glass. Gently pour the champagne into a mixing bowl. Measure out 1/2 cup of boiling water in a separate bowl then add 1 gelatin packet to the water, gently stirring. Once combined, pour the water/gelatin mixture into the champagne and gently stir. Divide the champagne jello into glasses. If you want the jello to set at an angle, place the glasses in a muffin or mini muffin pan at an angle to set in the refrigerator. Once the champagne jello has set, begin to prepare the creamy layer. In a mixing bowl, combine the sweetened condensed milk and 1 cup of boiling water. Stir to combine. In a separate bowl, combine the 1/2 cup cold water and 1 gelatin packet. Stir to mix. Allow the gelatin mixture to set for 2-3 minutes. Pour the gelatin mixture into the sweetened condensed milk mixture and stir to combine. Divide the creamy layer into the glasses. If you want the jello to set at an angle, place the glasses in a muffin or mini muffin pan at an angle to set in the refrigerator. Repeat the instructions for the champagne layer to add the final layer to the cups. Use a small amount of corn syrup and your finger, a small metal spatula or a small new paint brush to dab a little bit of corn syrup all around the rim of the glass. Then turn the glass upside down into a shallow bowl of sprinkles, moving it around until the rim is covered. Serve the jello or refrigerate until ready to serve.